Java NIO is my favorite topic. I have been working with NIO since last 2 years and would like to share simple Server-Client code for my readers who are free to use this code in their production environment. Starting JDK 1.4, NIO was created to allow all Java programmers to implement very high-speed input/output without having to deal with custom native code. NIO uses java.nio.buffer library compare to simple I/O which drains and fills back buffer internally any operating system. 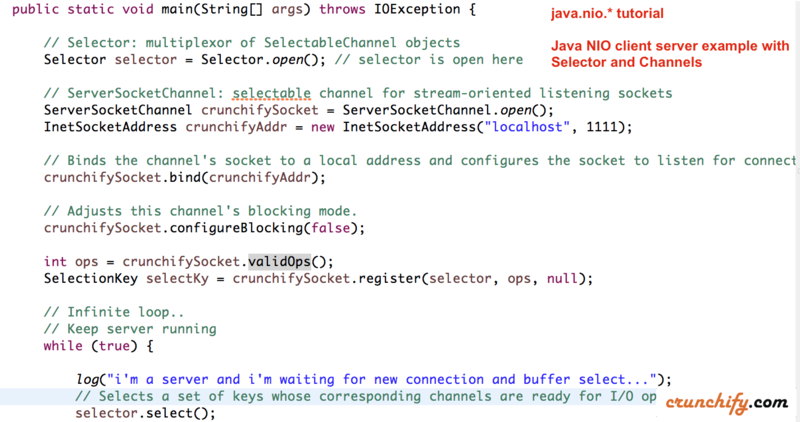 In this tutorial we will go over java.nio.channels and java.nio.channels.Selector libraries. channels represent connections to entities that are capable of performing I/O operations, such as files and sockets; defines selectors, for multiplexed, non-blocking I/O operations. selector may be created by invoking the open method of this class, which will use the system’s default selector provider to create a new selector. // Adjusts this channel's blocking mode. From the client, how do I maintain a persistent connection? You could use socket.setKeepAlive(true); to have connections alive from client side. How do I read a response to the message I send to the server. The server keeps generating messages every 10 sec. I just need to read response to my request. From what I understand, TCP “streams” data instead of end of record, etc. For client server communication, a protocol needs to be well defined. readLine() call will be blocked until all data will be returned, so don’t use it. Try reading bytes from the stream until -1 is returned.